Although I have been back a while, I recently submitted my post to I Choose Indy . The website is a tribute of sorts to those who choose to live in Indy. There are many reasons to choose Indy as home, mine has to do with family and quality of life ( no more two hour commutes in traffic) the seasons, (fall is my favorite), and Hoosier Hospitality. Here s the post I submitted to I Choose Indy! 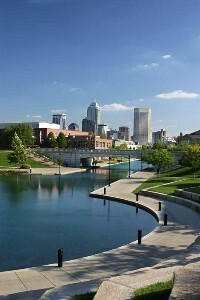 In the summer of the late 60's, my family decided to leave Louisville KY. to start a new life in Indianapolis. You could say Indianapolis chose me! With six children in tow, my parents settled in the area now known as South Broad Ripple. Back then, the name and area of Broad Ripple did not hold the allure it does today. The Monon Trail was actually still a railroad track. We used to play for hours at Arsenal Park, running under the water of the spray pool, swinging and singing the words of Rod Stewart's, Maggie Mae . The whole family took swimming lessons at Broad Ripple Park. My brothers played little league baseball close by and we went to the State Fair every year. It was the life. In the early seventies we moved to the near west side where you could hear the roar of the Indy cars. I remember it was the first home my parents owned. They were so excited and I had little understanding as to why. To me, it was another home. I spent the rest of my home years there. The westside of Indianapolis became home to me. I eventually married, had three of my children at Methodist Hospital and started my own journey. My family's journey took us to New Jersey, St. Louis, Missouri, Phoenix, AZ, Southern California, back to Phoenix and now here. We have come full circle and this time, 'We chose Indianapolis! My husband could probably live anywhere........me, I love to be with family and friends. As my children have grown, I have a daughter, son-in-law and two grandaughters here in Indy. A daughter, son-in-law and a grandson in Ohio, plus a grandbaby on the way. And one daughter who is still at home. She actually wanted to move back here and she is the only one not born in Indiana. Most of my family still lives here as well as a few high school friends. What makes a person leave the beauty of the Southwest for the plains of Indiana. It is a home coming and one which is overdue. I love the seasons, the trees in bloom, the warm loving people. I am a hoosier at heart and I have come home. Today, I am a Realtor in Indianapolis who understands what it means to buy your first home, sorry Mom and Dad! I also know and understand the need for more space when the children are growing and now, I know what it means to downsize. I am happy to be home and look forward to assisting many in their search for the home which matches their life phase and lifesyle.